I know, I know, I KNOW. There’s a special kind of frustration and pressure that mounts when you walk into a store in October (probably still wearing short sleeves!) only to see Christmas decorations up already. Goodness, let me have my fall, people! I’m not even getting to wear my boots yet! But what I do appreciate are all the great ideas for holiday gifts that are creeping into my Pinterest feed, and the fun craft ideas that float across Facebook. And given that I have almost already filled my entire schedule for the next 12 weeks, I am glad to be reminded that if I want to make a few thoughtful gifts, it might be time to plan on it now. So while we’re not ready to turn on the Christmas tunes at Beeyoutiful headquarters and throw any tinsel just yet, we are going to give you a head start with our list of seven Christmas gifts you might want to make or purchase before the holiday rush this year. They’re not edible, but these cookie imposters smell divine and are great as teacher gifts or for Grandma. *You can also add small amounts of glitter to your dough to add extra glitz to your ornaments! Mix until thoroughly incorporated. Place dough on a sheet of cinnamon-dusted waxed paper; place a second sheet on top of the dough. Roll to 1/4 inch thickness, and then peel off the top paper. Use your favorite cookie or biscuit cutters to cut dough into shapes. Using a thin spatula, place dough shapes on a parchment paper-lined cookie sheet. Using a ice pick or skewer, poke a hole on the top part of each ornament to later insert the ribbon. Bake in a preheated oven at 200* until solid (up to 2 hours). Once cooled, insert ribbon or decorative string and tie in a hanging loop. Hang on your Christmas tree or anywhere you’d like to spread the scent of Cinnamon. This is a great gift for those on your list who enjoy a bit of pampering. Mix together until thoroughly incorporated and then store in a tightly capped glass jar. Place in tins or decorative glass jars for a beautiful gift. Use a chalk board tag and a liquid chalk pen for an added cute touch on the label. Buy your herbs and spices in bulk and create some of your own blends, then give them as gifts to your favorite cooks! Several popular spice blends are Cajun, Italian, Herbs de Provence, Ranch, and Cinnamon Sugar. Here’s a salt blend to get you started. Mix together and store in a tightly capped glass container. Pop your popcorn, then melt butter and add 1-2 teaspoons of this salt to taste. (I also like to add the juice of a lime.) Drizzle over freshly popped popcorn and toss to distribute evenly. Create your own unique aromatherapy blends using your favorite essential oils, jojoba oil, and an empty rollerball bottle. The Complete Book of Aromatherapy and Essential Oils has some great recipes and tips on making safe and fragrant blends! Get our delicious recipe here! Make it ahead in big batches, then portion it into pretty containers to gift later. Choosing a favorite wellness book for a friend is a great way to share information and education, and boost their long-term health too. Talk about a gift that keeps on giving! Here’s a confession: by this time in the spring, I am about ready to open all the doors and windows and power wash the dust, dirt, and ick of winter away! It is so nice to get the stale air out and the fresh air in. Like many of you, my work schedule is such that massive cleaning jobs usually end up on the weekends. All seven of us end up pitching in to get projects done before we head for the outdoors and eat up this weather! These tips have become my go-to strategies, and they’re such an easy way to not only freshen up our house but also ensure it smells as clean and inviting as it is. 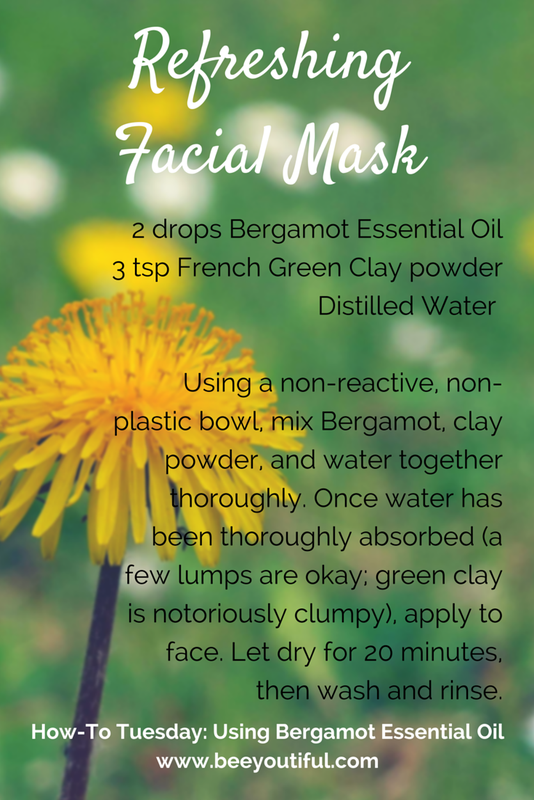 This not only saves money, but personally selecting the ingredients (instead of trusting a mysterious chemical mixture!) also guarantees that they’re the ones you are confident about using with your family. 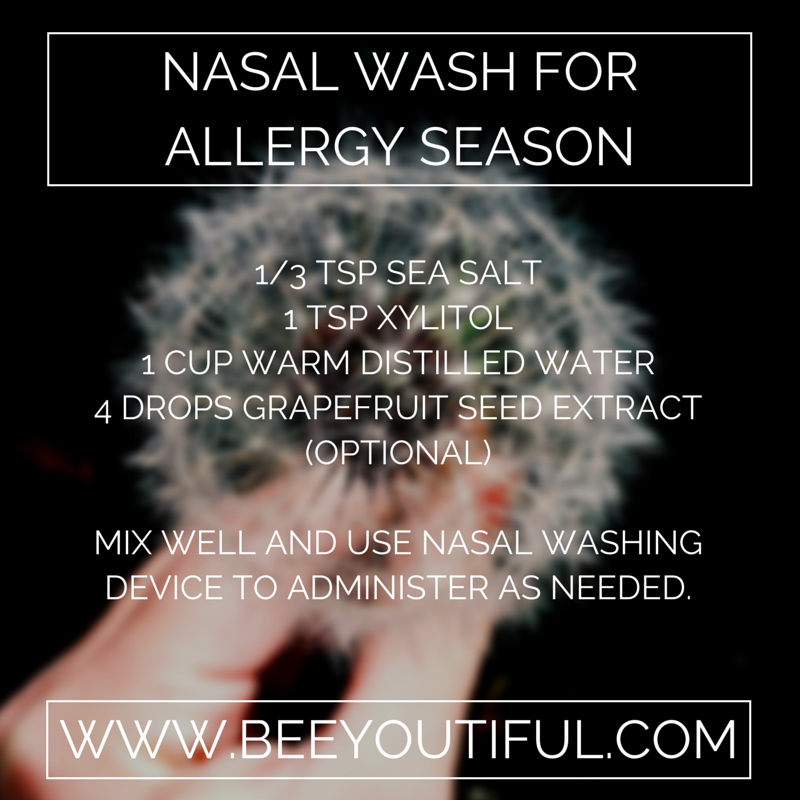 Mix together in a spray bottle; shake well before using. 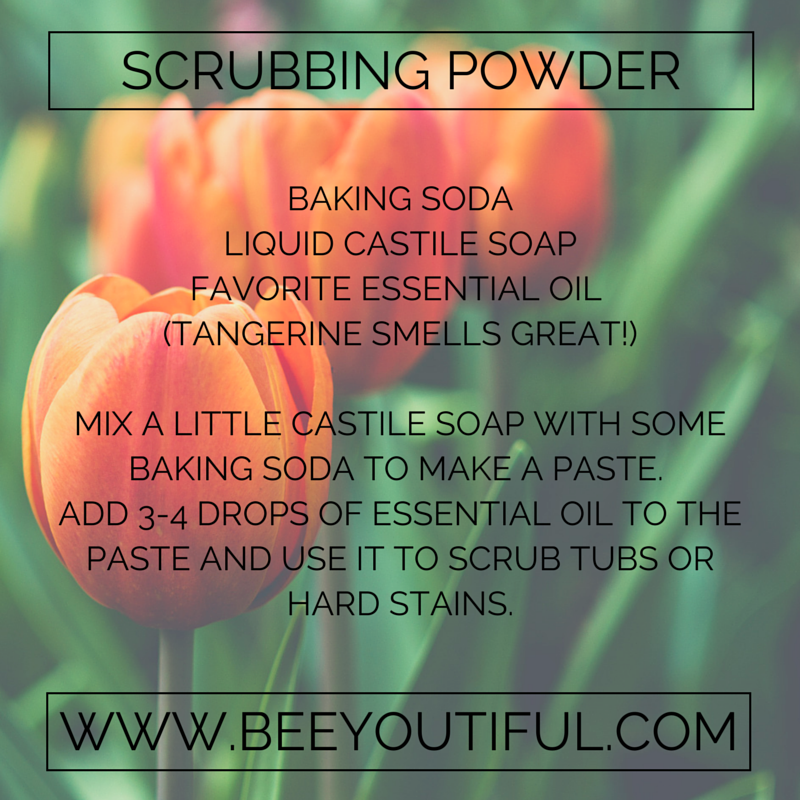 Mix a little castile soap with some baking soda to make a paste. Add 3-4 drops of essential oil to the paste and use it to scrub tubs or hard stains. Use several drops on a soft cotton rag to clean and dust wooden furniture. Note: always test on a small hidden spot prior to using liberally. We typically avoid using perfumed products in our house, but let’s face it: between stinky men, long days in the sun learning to homestead, and kids that play hard, sometimes you just need a little smell-good joy in the laundry room! Optimally, every load would dry in the sun and smell like my childhood, but for the days when that cannot happen, I keep my favorite fragrances on hand to make sure our laundry smells it best. You can add a drop or two of essential oil to your laundry detergent before pouring it into the washer (except for when washing cloth diapers; skip the oils then). Or do like I do: I use a small rag (cut up holey t-shirts work great!) and put a drop or two of my favorite essential oils on it and toss it in the dryer with our clothes. While I prefer to have my windows thrown open, occasionally the pollen, spring storms, pesky bugs, and fluctuating temperatures make me keep the windows tightly shut! Thankfully, my diffuser brings a little bit of spring inside. Keeping my favorite happy blends or recipes available brings cheer and can help cleanse the house of hidden germs as well. Add 10 drops each of Tangerine, Lemon, and Spearmint with 2 drops of Black Pepper for a cheery blend. 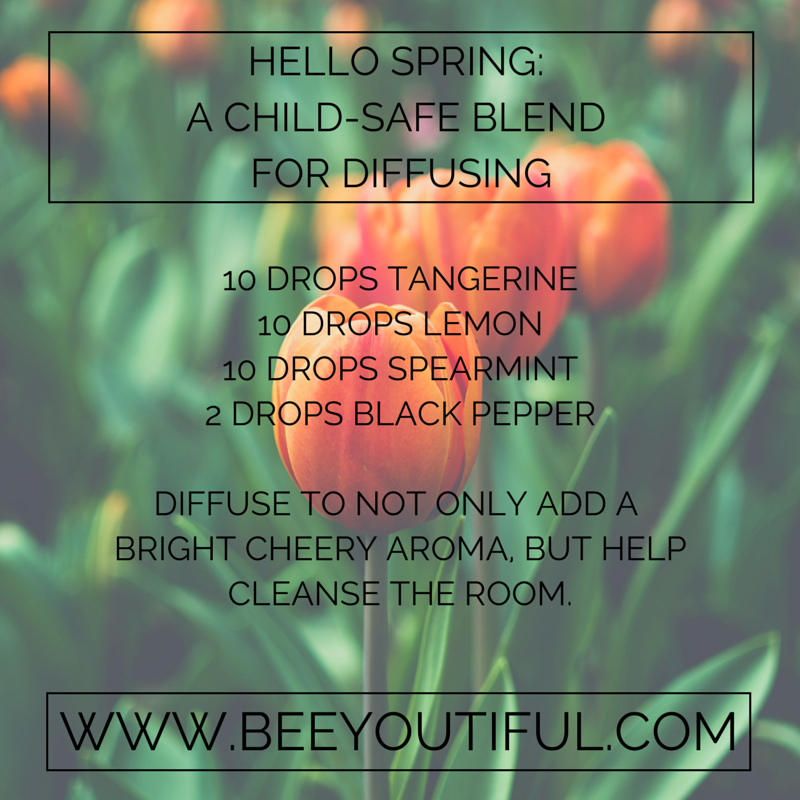 Diffuse to not only add a bright cheery aroma, but help cleanse the room. For many more tips and recipes, follow our Essential Oil board on Pinterest. Be sure to get our printable Spring Cleaning Checklist, too! It’ll help you stay on track as you move from room to room in your house. We would love to hear your favorite recipes and tips, too! Make sure to show us how you are using Beeyoutiful’s Essential Oils; tag your social posts with #BeeYouEOs so we can see. Beeyoutiful not only has an amazing adult team working together to bring great products to you, but we also currently have a small army of kids with us. When we all get together, there over a dozen little ones 10 and under, all playing together and getting into everything. As you can imagine, we also have our share of sniffles, sneezes, upset tummies, and overstimulated and sometimes even sad littles ones. Essential oils are one very prized part of our toolbox to help support our wee lot. It can be hard to know which essential oils are appropriate for these young ages. After much researching and reading, we’re sharing a list of the oils that we personally use in our homes, along with a few tips on how we use them with our children. 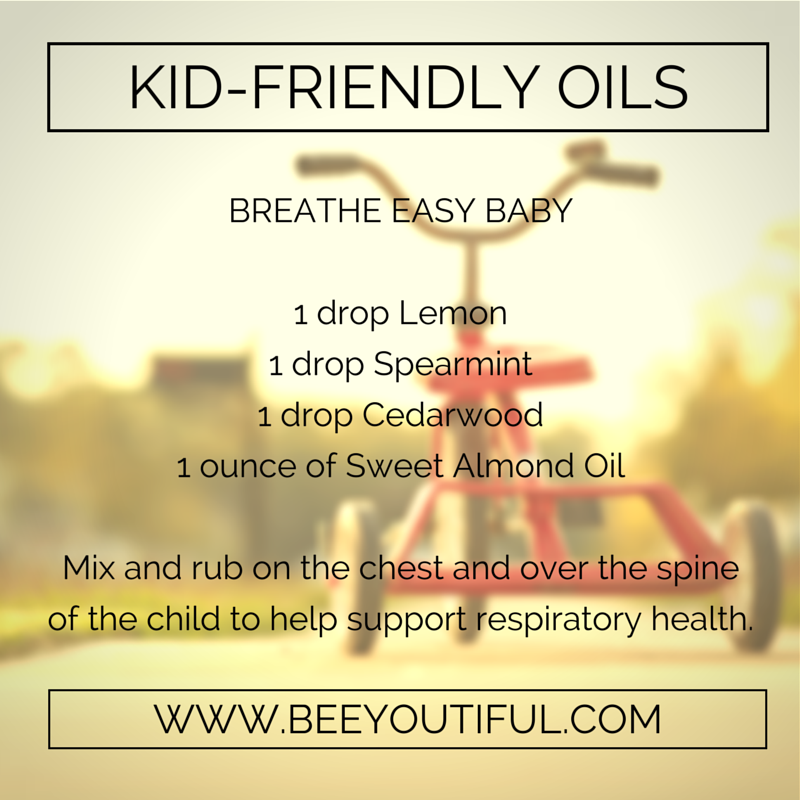 We’ve also bundled some of the most popular kid-friendly oils for respiratory support here. Gently massage child all over, or focus on applying the blend to the spine, base of the neck, abdomen, and bottom of the feet. Mix and rub gently on abdomen, back of the neck, and spine, or rub on bottom of the feet during times of nausea or upset tummies. 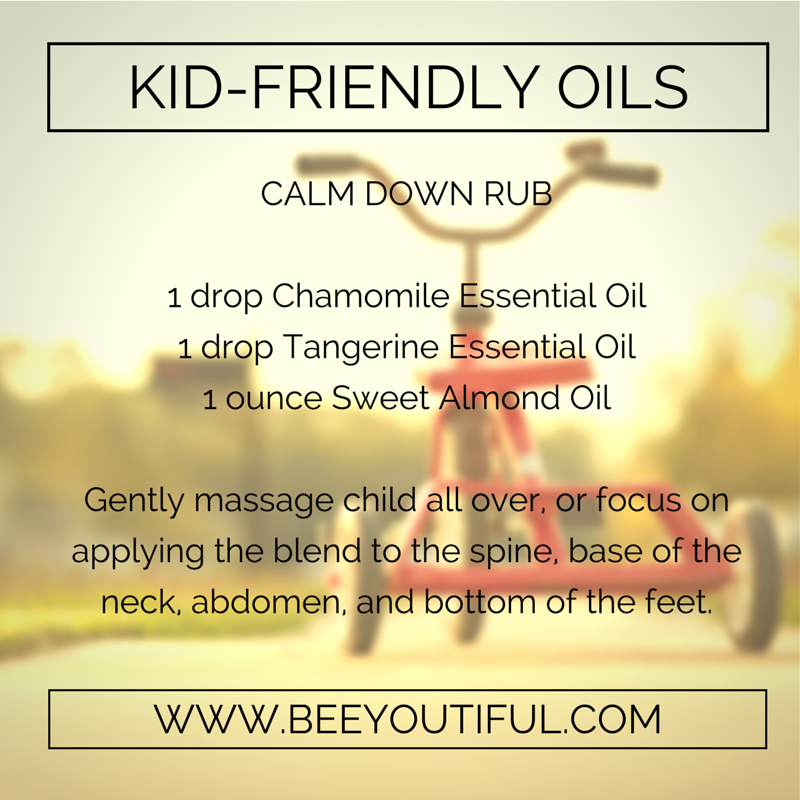 Mix and rub on the chest and over the spine of the child to help support respiratory health. Add equal parts Cedarwood and Lemon to a diffuser. 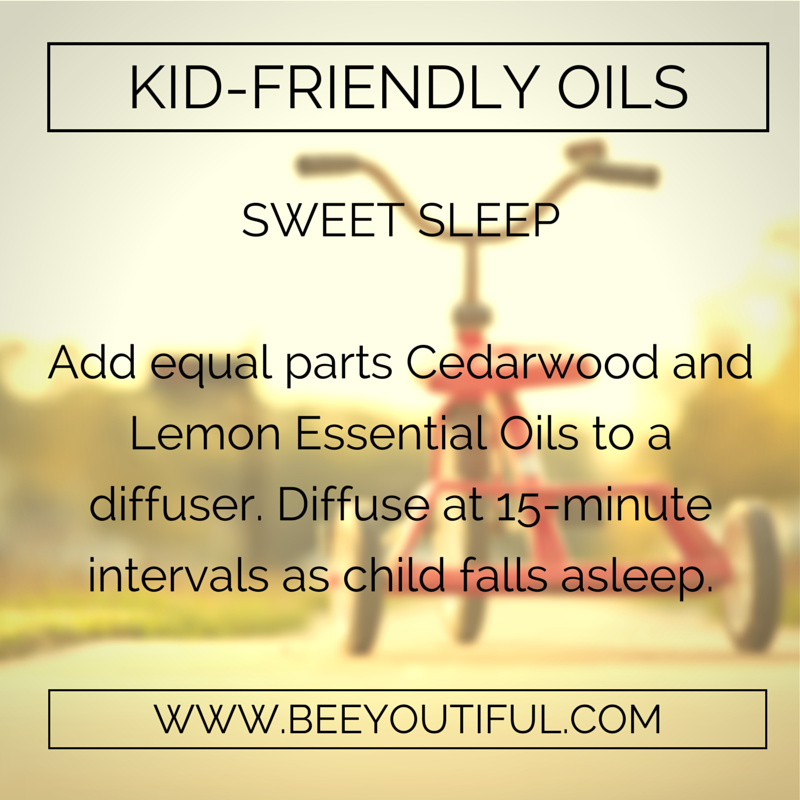 Diffuse at 15 minute intervals as child falls asleep. Mix 1 drop of Lavender Essential Oil with 3 Tablespoons of Jojoba Oil. Make sure baby is lying on a warm and comfortable surface, and that your hands are warm (if you’re cold, wash your hands in hot water to warm them up). Use gentle, steady pressure and a calm, comforting voice while touching your baby. Keep continual contact with the baby’s skin. Discontinue massage if you or the baby experience stress or unpleasant emotions; massage should be a tender way for baby and parent to bond and encourage healthy development. Know a parent who could benefit from this information? Want to remember it for later? Use the buttons below to share it, pin it, tweet it, send it!